This past term 32 students from Bishop Smith Catholic School in Pembroke, Ontario commemorated the children who died at Thunderchild IRS and Sturgeon Landing IRS, both in Saskatchewan. 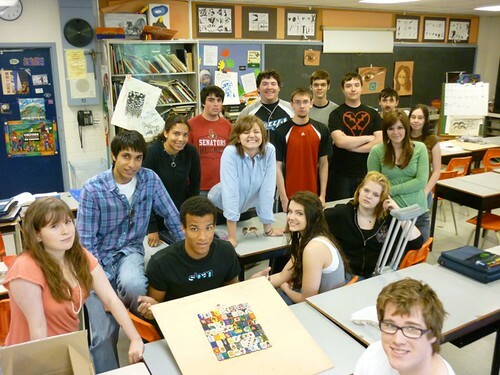 The Bishop Smith participants were students of Kathrin Winkler, teacher of Aboriginal Cultures through the Arts. “It was an amazing gathering to smudge the tiles. I ended up clearing the cafeteria and moving tables around to crate a large circle-kept inviting classes to participate. During the smudging of the tiles and throughout, our guests from Pikwakanagan were received with total respect and interest by the participants who were also able to be smudged,” Kathrin reported. A journalist from the Pembroke Observer covered the smudging ceremony which was held, very appropriately, on Earth Day. For the social justice action component of Project of Heart, the students discussed the issue of missing and murdered Aboriginal women, then circulated and signed the Amnesty International petition drawing attention to the Stolen Sisters campaign.